The pastor also appeared to criticize the parenting skills of African-American women. 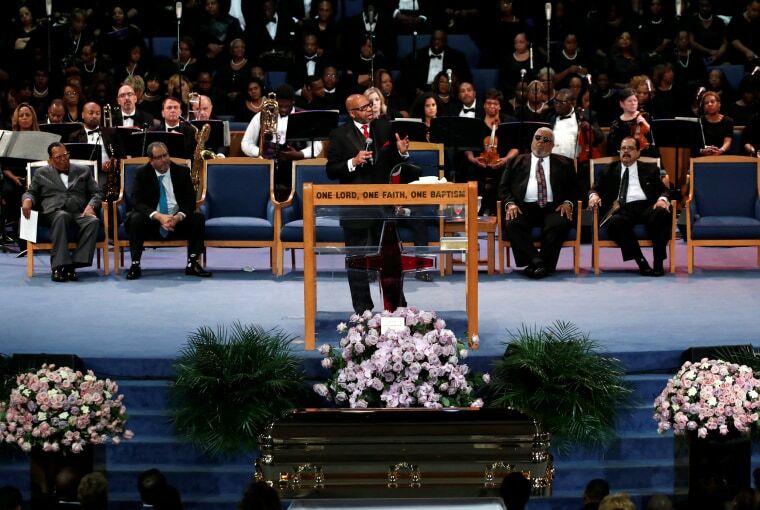 An Atlanta pastor delivered controversial remarks during Aretha Franklin's funeral in Detroit Friday, criticizing black-on-black crime, African-American mothers and gay people. He even appeared to take a swipe at the Queen of Soul herself. Rev. Jasper Williams Jr., who is black, said African-Americans kill the same number of black people slain by the Ku Klux Klan throughout history in a matter of months. Speaking of "black-on-black" crime, he said, "There's got to be a better way." The pastor, who also delivered a eulogy for Franklin's late father in 1984, said African-American mothers "cannot raise a black boy to be a man." And he said, "The straights need to respect the gays. The gays need to respect the straights." The pastor's theme was "soul," a key element of Franklin's moniker, but he questioned "the queen's legacy." Many on Twitter who watched the speech said it was disrespectful. Writer Stacy-Ann Ellis tweeted, "I feel so awful for her family after that eulogy. He was so insensitive to their grief." The backlash was swift, with many people drawn to one theme: Allegedly out-of-touch sermons like Williams' have kept African-Americans out of church. "This eulogy is exactly why people cease going to church," said photographer Like Sippi. Aretha lived a different life than this eulogy. A woman who identifies herself as D. Danyelle Thomas said, "Toxic Theology is what’s emptying your pews, period." In a recent Facebook video Williams said he had been invited by Franklin to speak at the funeral. He said he was "privileged" to preach there. "It was on of those things that God just gave me," he said.